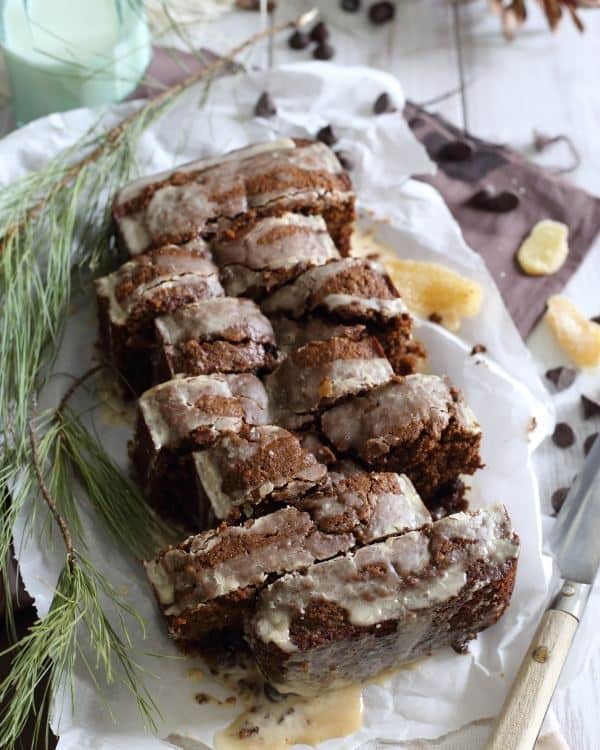 This chocolate gingerbread loaf bread is topped with a sweet gingerbread tea glaze. It’s the perfect holiday sweet treat. For something like 29.5 years, I didn’t care for gingerbread at all. Never understood the hype and a flat crunchy brown cookie was not going to convince me otherwise (chewy and soft is where the cookie love is at!). But then I made these chocolate chunk molasses gingerbread cookies and had a change of heart. They were soft, chewy, filled with chocolate (the perfect gingerbread accompaniment in my opinion) and just the thing to make me realize there were other ways to enjoy the flavor besides the iced flat brown cookie dude. And let me tell you, I’ve gingerbread-ed all.the.things this year. From pancakes, to waffles to pork chops (yep, made this tea glazed pork chop recipe with gingerbread tea too!) and more. I’ve gone through three boxes of Celestial Seasonings Gingerbread Spice tea and it’s not even Christmas yet. Opening the latest box though got me thinking how delicious the tea would be infused into a bread and then drizzled in more gingerbread flavor in the form of a glaze. Which is exactly what this bread is. It’s a hearty little loaf made with buckwheat and whole wheat flours but it packs a seriously flavorful punch. The flavor from the tea and spices comes through in a big way but isn’t super overwhelming since it’s paired with the chocolate. Each bite is spicy, chewy and chocolaty with a sweet crunchy exterior from the glaze. It’s everything I want in a holiday dessert. Besides infusing the teas into your baked goods this season, Celestial Seasonings holiday teas (Candy Cane Lane, Sugar Cookie Sleigh Ride and Gingerbread Spice) also make great stocking stuffers for tea lovers. The aromatic blends of each one make you feel like you’re sitting right in front of the Christmas tree with the fire going in the background. 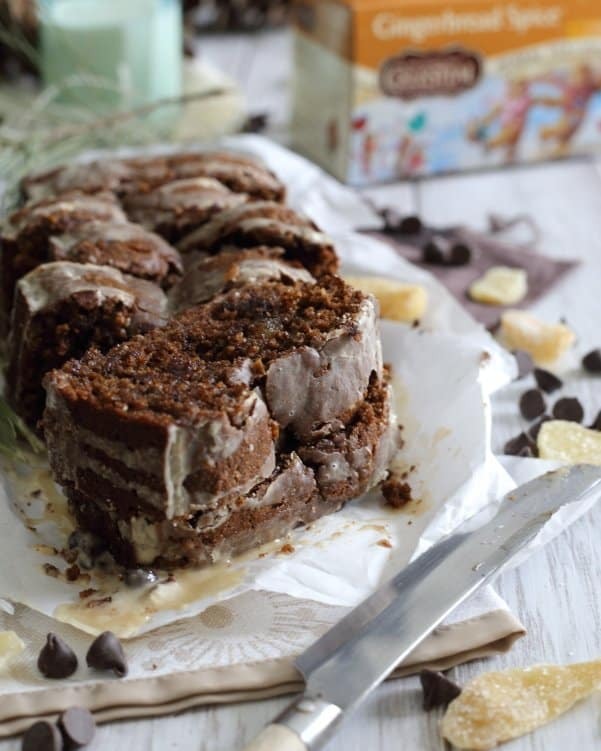 Love this chocolate gingerbread loaf? This chocolate gingerbread loaf is topped with a sweet gingerbread tea glaze. It's the perfect holiday sweet treat. Preheat oven to 350 degrees and grease a small loaf pan (8x4 or smaller) with baking spray. Heat the milk in either the microwave or on the stove top until hot. Add the tea bag and steep for 5 minutes. Squeeze the tea bag and discard. Set aside. Combine the flours, cocoa powder, baking soda, salt and spices in a large bowl. Whisk together the brown sugar and butter until smooth in a small bowl. Add the egg and molasses and whisk again until incorporated. Add the milk and whisk again until smooth. Pour the liquid into the large bowl with the flour and stir until combined. Add the chopped ginger and chocolate chips and fold in. Transfer the batter to the loaf pan and bake for about 30 minutes until a toothpick inserted in the middle comes out clean. Remove from the oven and let cool for at least 10 minutes before removing from the pan to a cooling rack. Let the loaf cool completely before glazing. Heat the milk until hot in the microwave or in a sauce pan and add the tea bag. Let steep until milk has cooled to room temperature. Squeeze the tea bag and discard. Add the vanilla to the milk mixture and stir. Add the powdered sugar slowly and mix with a whisk until smooth. Pour glaze over the cooled loaf and let set for a few minutes before serving. You'll likely have a bit of extra glaze. *This post is sponsored by Celestial Seasonings. All content (besides their drink recipes) and opinions are my own. I just tried Sugar Cookie Sleigh Ride, and have become OBSESSED with it! Next up will definitely be Gingerbread spice! And I love that you made a loaf – so creative! Pinned! This looks incredible! What a beautiful loaf of bread. And tea glaze = mind blown. Can’t wait to try it out! Glad you’ve turned into a gingerbread fan! i love what you did here! I still haven’t tried the gingerbread tea but now I must! I was never really a fan of gingerbread either. I’ve always loved ginger so I decided to give gingerbread a try again a few years ago and am hooked. I love the idea of this bread with the tea glaze. Looks amazing! It wasn’t until yesterday that I realized I was a fool for hating gingerbread for so long. 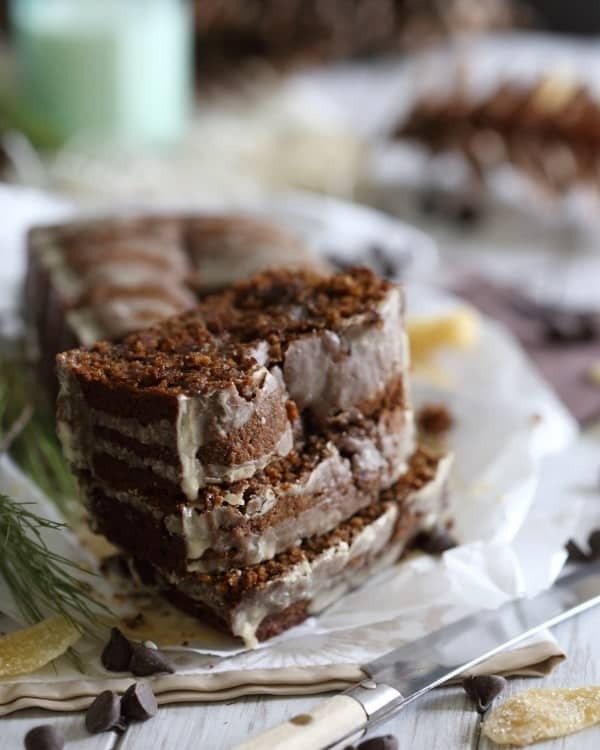 There is seriously nothing better than a delicious piece of gingerbread cake. I love the tea glaze – genius! 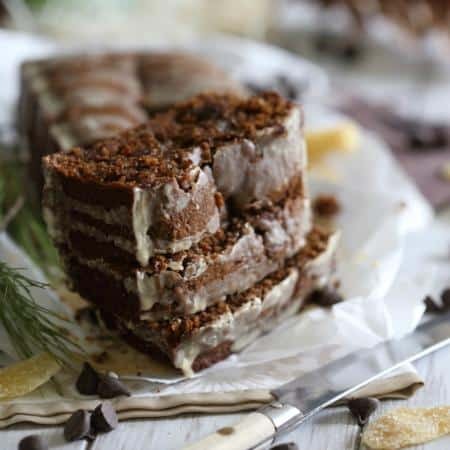 Chocolate and gingerbread together is such a delicious flavor combo, I bet this loaf is out of this world delicious! I don’t know how I feel about drinking flavored teas, I’m a little boring in that department but I LOVE the idea of baking with it. This bread looks rich and tender and perhaps, just perhaps i’ll sit down with a cup of gingerbread tea to have with it. I felt the same way about gingerbread until last year . . when I had my first real properly baked homemade gingersnap cookie. This is when I fell in love . . love that you used Gingerbread Spice tea for the bread and glaze! pretty genius, yo. I can’t even handle this. Gingerbread anything is heaven to me, and this loaf looks so moist and fluffy and that glaze. Uhhhh wow. I am buying that tea just so I can make this. I recently discovered how wonderful tea bags work for baking! I’ve used another flavor from Celestial Seasonings (Dirty Chai…heavenly! ), and now I’m excited to try Gingerbread in this recipe! Looks incredible!